Wow, was that some bad football. Let’s not get too negative, however. The Eagles won their second straight game, and amazingly, at 3-3, lead the NFC East division. It’s not even a tie, given the head-to-head tiebreaker with New York, though they’ve lost to two of their three division rivals. Philadelphia’s defense was outstanding after allowing an 80-yard touchdown drive in the first five minutes. New York managed only 167 yards the rest of the game as Eli Manning took three sacks and seven QB hits. For the first time ever, young superstar Odell Beckham Jr. failed to catch a pass for an entire half (the second). He finished with only 61 yards — less than Riley Cooper and only one yard more than Miles Austin, on twice as many receptions. That’s gotta sting. Demarco Murray goes around the right end for a 12-yard TD. Also, the Birds’ offensive line was strong for the second game in a row, and this opened up DeMarco Murray for his biggest game as an Eagle, 109 yards on 22 carries for a healthy 5.0 YPC average. The best part of that — besides opening up play action and bootleg passes — was that for the first time in the Chip Kelly era, his team was able to consistently run a four-minute offense to protect its lead. The Eagles had a nine-minute drive against Green Bay in 2013, and, um, Chip had another one with Oregon in the 2010 Cal game. But those were single drives, years apart. 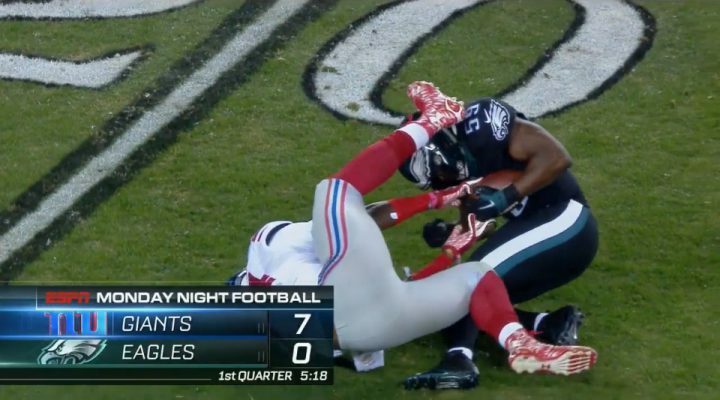 For once, Philadelphia did not let an opponent claw their way back into a game. New York never really came close to scoring after that first drive, as the Eagles’ front line ground them down like a mortar and pestle while the offense ran off second-half drives of 5:16, 4:00, 4:36, and 3:33 (until time expired) to put it away. Philadelphia even won the time of possession battle, 30:30 to 29:30. You’re probably thinking, “Hey, that sounds like a great win, not ugly at all!” Well, you’re wrong. I haven’t mentioned the turnovers yet. They worked both ways. The Giants had coughed up only three in the first five games combined. Monday night, they lost the ball three times in a stretch of 14 offensive plays that started late in the first quarter, matching their total in the previous 328 plays. 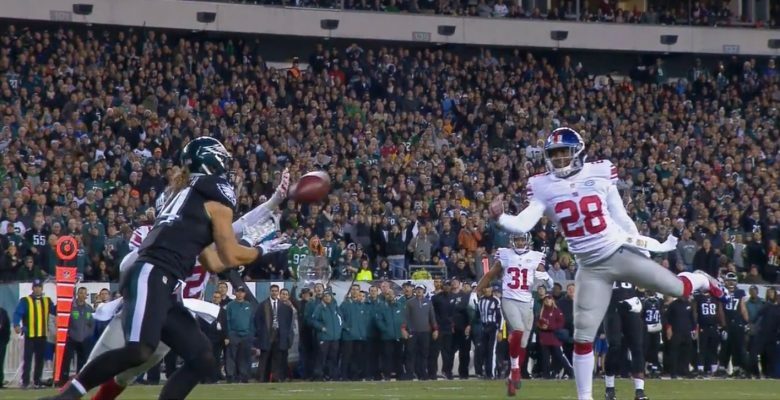 Give the Eagles credit; these were intentional, aggressive plays by the defense, not careless mistakes by New York. First, DeMeco Ryans just ripped the ball out of the hands of Larry Donnell, who caught the winning touchdown against San Francisco last week. It was ruled an interception but Donnell made a good catch. DeMeco just decided that as a storied veteran, he deserved the ball more. And so he grabbed it out of Donnell’s arms. On the next drive, New York had a second-and-one at the Eagles’ 41; they got stuffed three straight times and turned it over on downs. The Giants got it back after a punt; Nolan Carroll‘s pick six quickly made it 14-7. Then it got really ugly. 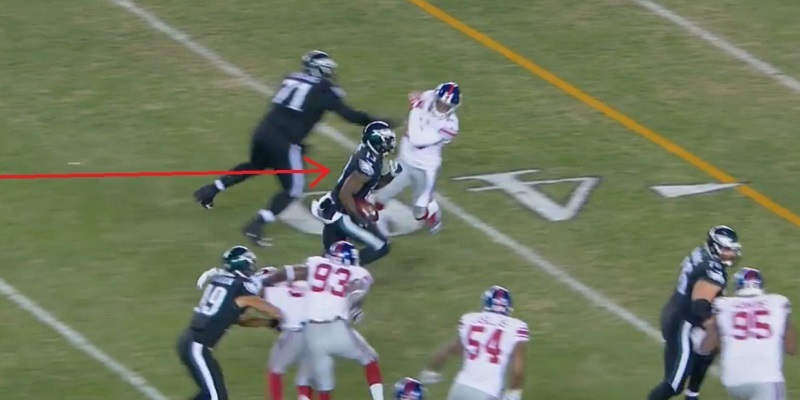 Five plays later, Malcolm Jenkins stripped RB Rashad Jennings and Ryans recovered. Bradford threw an interception. Both teams had a couple of three-and-outs. DeMarco’s running and the Eagles’ defense were about the only decent football played for the rest of the game. Sam Bradford was 24-of-38 for 280 yards and a touchdown. And he was awful. His long passes were often short (just like the previous week against the Saints), and the Eagles were very lucky that Riley Cooper’s touchdown catch wasn’t intercepted. He was wide open but had to come back and wait for it as two DB’s closed on him. There were simple screens and flat passes where Bradford wasn’t even close, and he flubbed a handoff to Murray — even though they played together (and handed off hundreds of times) in college. Worst of all, Bradford threw three interceptions under no pressure at all, launching long bombs with a big lead and no pass rush, right into the arms of defenders. During the first quarter of the season, fans and writers were yelling for Bradford to take more shots down field. Now they realize why he didn’t, and wish they could take it back. The other player who has been inexplicably bad this year is Jason Kelce, the Eagles’ Pro Bowl center. He missed blocks, was called for holding to negate a seven-yard run and hiked one ball too early, right past Bradford’s ear. The Eagles recovered for an 18-yard loss. It’s all the more confusing because journeyman Allen Barbre and third stringer Matt Tobin, the replacements at guard for released starters Mathis and Herremans, are playing pretty well. This team is winning with bad quarterback play and no standout receivers, thanks to a top-five defense and a recently mended running game. And even with all of Bradford’s miscues, he’s on pace to throw for 4,000 yards this year. Even in Nick Foles’ miracle year, 2013, he managed only 2,891 in 13 games, a 3,500-yard pace. Philadelphia will likely win its division (by default, but hey, close enough). With this defense, it doesn’t need Bradford to be the hero. He has 10 games to settle down, and if he does, Chip Kelly has a good shot at picking up his first playoff victory.